These RF Products are ideal for short-range wireless remote control applications where cost is a primary concern. These modules require no external RF components except for the antenna. They generate virtually no emissions, making FCC and ETSI approvals easy. The receiver WZ-R434 and WZ-R418 has a sensitivity of 3uV. 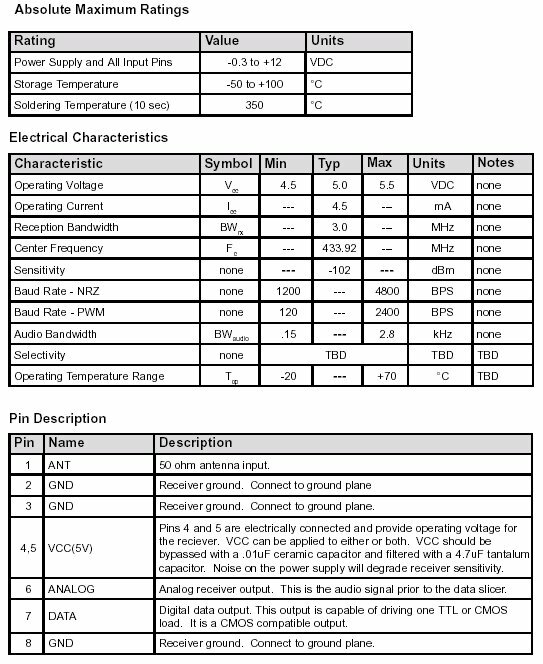 Operating voltage is from 4.5 to 5.5 volts-DC, and has both linear and digital outputs. For maximum range, we recommend antenna length to be 1/4 wave of the frequency, That means, for 433.92Mhz, the antenna length is approximately 17cm long . 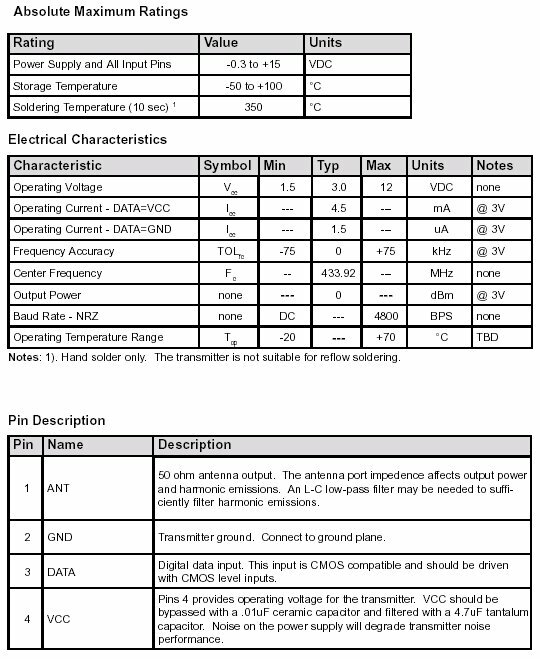 The typical sensitivity is -103dbm and the typical current consumption is 3.5mA for 5V operation voltage. Pricing order your modules today! WZ-433AS series RF transmitter modules offer a cost effective, high-performance solution for remote control type applications. The transmitters are very small (.25" x .4"), have a wide operating voltage range (2-12V), and can deliver 0dBm output power into a 50 ohm load at 3V. SAW-stabilized design guarantees that the center frequency is accurate to ±40kHz (@3V), making it suitable for use with any ASK/OOK receiver available. The WZ-433RP series RF receiver modules offer an extremely low cost solution for remote control type applications. The receivers are compatible with almost any ASK or OOK data transmitter and can receive legally transmitted signals from distances as far away as 300 feet. The receivers operate at 5V and draw only 4.5mA. These RF modules do not require licensing to operate ( 260-470 Mhz ISM band ). They are not FCC approved, but have been designed to comply with FCC Part 15 Rules and Regulations. 315Mhz is commonly used for garage gate openers, keyless security system or car alarm applications. 418Mhz is used for low data rate telemetry or radio command system in Canada, USA and UK. 433.92Mhz is commonly used throughout Europe and North America, many kinds of commercial applications are using this frequency.